Breast cancer is one of the most heavily researched diseases to date. Current statistics suggest that 1 in 8 US women will develop breast cancer within her lifetime.1 Approximately 250,000 new cases of invasive breast cancer and 63,000 causes of non-invasive breast cancer diagnoses are estimated to occur in the US during 2017. Triple-negative breast cancer (TNBC), a type of breast cancer which does not respond to traditional hormone therapies, is one of the most difficult-to-manage breast cancer types. Studies using CT imaging have shown that targeted pharmaceutical approaches to TNBC may be a potential management strategy. Imaging with microPET/SPECT/CT imaging systems can be helpful for assessing response to this approach while also helping to modify therapy structure. Thus, a more optimized approach to cancer therapy can occur when using microPET/SPECT/CT imaging, potentially resulting in favorable survival outcomes for more difficult-to-manage diseases. TNBC is a type of breast cancer that proves difficult to manage due to the disease’s heterogeneity. AXL receptor tyrosine kinase, a regulator of EMT and a component often overexpressed in numerous solid tumors, represents a potential therapeutic target for TNBC. A new study examined the effect of targeted therapy in TNBC by using Bruker BioSpin’s Albira Si microPET/SPECT/CT system. The researchers in this in vivo microCT imaging study chose 17-allylamino-17-demethoxygeldanamycin (17-AAG, or tanespimycin) as the therapy for downregulating AXL expression. Researchers used Bruker BioSpin’s Albira Si microCT (microPET/SPECT/CT) system along with 64Cu-labeled anti-AXL antibody for imaging AXL downregulation via 17-AAG. Tumor-bearing mice injected with either 64Cu-anti-AXL or 64Cu-IgG underwent a 15-minute PET/CT scan with Bruker’s Albira Si microCT imaging system. Manual drawing of volumes of interest over the tumors was performed for each scan for recording mean radioactivity, ultimately helping to obtain a standard uptake value. Exactly 24 hours after 64Cu-anti-hAXL or 64Cu-IgG intravenous injection, microPET/CT imaging found that tumors were delineated by 64Cu-anti-hAXL only. Additionally, tumor uptake of 64Cu-anti-hAXL was found to be nearly three times greater than 64Cu-IgG (14.48 ± 2.88 vs 5.24 ± 0.76 %ID/g, P <0.001). Imaging with Bruker’s Albira Si system showed that AXL expression downregulation by 17-AAG administration is a feasible management strategy. Also, researchers found reducing cell migration following 17-AAG injection. Compared with control mice, microPET/SPECT/CT imaging also showed that there was lower tumor radiotracer uptake associated with 17-AAG (60 mg/kg/dose, once a day for 9 days) after 64Cu-anti hAXL injection. Targeted cancer therapy may be one of the most effective ways for managing the disease; however, there are limitations to understanding appropriate therapeutic intervention in some tumor types. The imaging of tumor cells as well as their response to pharmacotherapy may help researchers optimize treatment protocol. Researchers concluded that AXL expression can be imaged and counted with the use of Bruker’s microPET/SPECT/CT imaging platform. Also, imaging with this system can non-invasively analyze the downregulation of AXL via the 17-AAG HSP90 inhibitor. This study demonstrates that imaging during treatment of TNBC may assist clinicians in monitoring the progression of disease, response to treatment, and dose optimization. 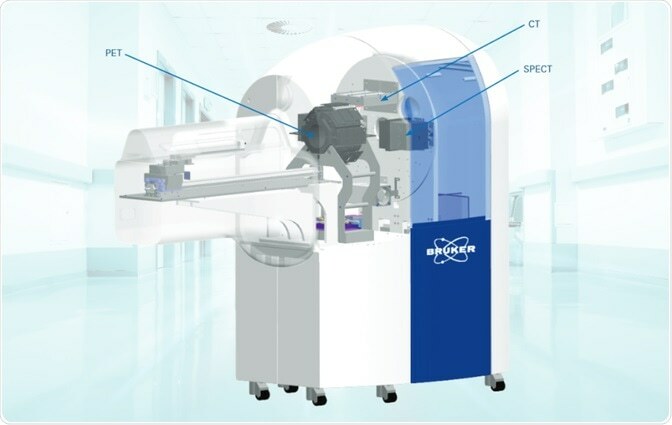 Bruker BioSpin’s Abira Si, a microPET/SPECT/CT imaging system, is the first commercial SiPM-based PET.10 Researchers in this study used the Albira Si for imaging and quantification of AXL expression and the response to therapy in TNBC. This imaging platform features a resolution of up to 0.7 mm for PET as well as 90 μm for CT imaging acquisition in three axes. For understanding the response to therapy, especially when it comes to minute cells or when used in small animal trials, imaging can prove invaluable in determining clear and accurate results. The Albira Si is compatible with magnetic resonance, another important imaging tool used in cancer research, helping to enhance imaging results in both preclinical and clinical studies. U.S. Breast Cancer Statistics. Breastcancer.org. http://www.breastcancer.org/symptoms/understand_bc/statistics. Updated March 10, 2017. Estimated New Cancer Cases and Deaths for 2017. Cancer.gov. https://seer.cancer.gov/csr/1975_2014/results_single/sect_01_table.01.pdf. Lehmann BD, Bauer JA, Chen X, et al. Identification of human triple-negative breast cancer subtypes and preclinical models for selection of targeted therapies. Journal of Clinical Investigation. 2011;121(7):2750-2767. Palmer TD, Ashby WJ, Lewis JD, Zijlstra A. Targeting tumor cell motility to prevent metastasis. Adv Drug Deliv Rev. 2011;63(8):568-581. Thiery JP. Epithelial-mesenchymal transitions in tumour progression. Nature Review Cancer. 2002;2(6):442-454. Bae SY, Hong JY, Lee HJ, Park HJ, Lee SK. Targeting the degradation of AXL receptor tyrosine kinase to overcome resistance in gefitinib-resistant non-small cell lung cancer. Oncotarget. 2015;6(12):10146-10160. Li Y, Ye X, Tan C, et al. Axl as a potential therapeutic target in cancer: role of Axl in tumor growth, metastasis and angiogenesis. Oncogene. 2009;28(39):3442-3455. Rankin EB, Fuh KC, Taylor TE, et al. 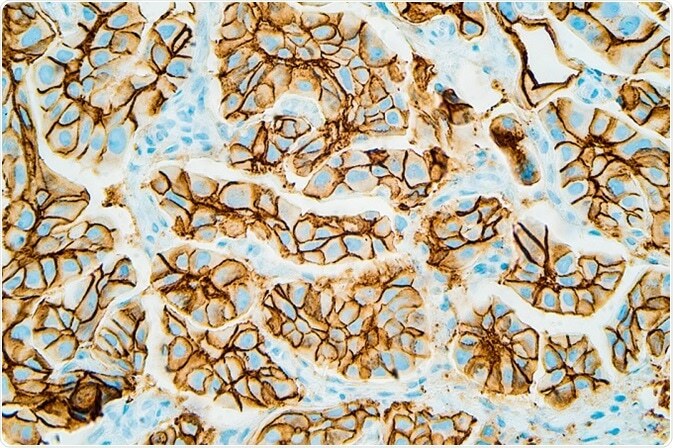 AXL is an essential factor and therapeutic target for metastatic ovarian cancer. Cancer Research. 2010;70(19):7570-7579. Wang W, Zhao J, Wen X, et al. MicroPET/CT Imaging of AXL Downregulation by HSP90 Inhibition in Triple-Negative Breast Cancer. Contrast Media & Molecular Imaging. 2017.